Hands In Art owner Margie Ramirez has built a business out of teaching art techniques to young people. Anaid Madrigal stands before a group of young girls enjoying a birthday party with an added twist. Madrigal is teaching the girls how to improve their artistic skills as each one draws little mermaids on their individual canvas boards. 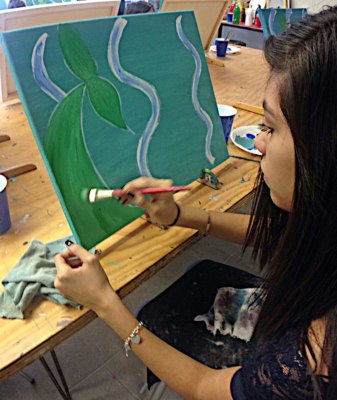 “Everyone paints differently, so you can paint your own version,” said Madrigal, an instructor at the Hands In Art Studio in downtown Mission. The art studio on Conway Avenue was a busy place on a recent Saturday. There’s the little girls painting mermaids as birthday cake and refreshments await them. 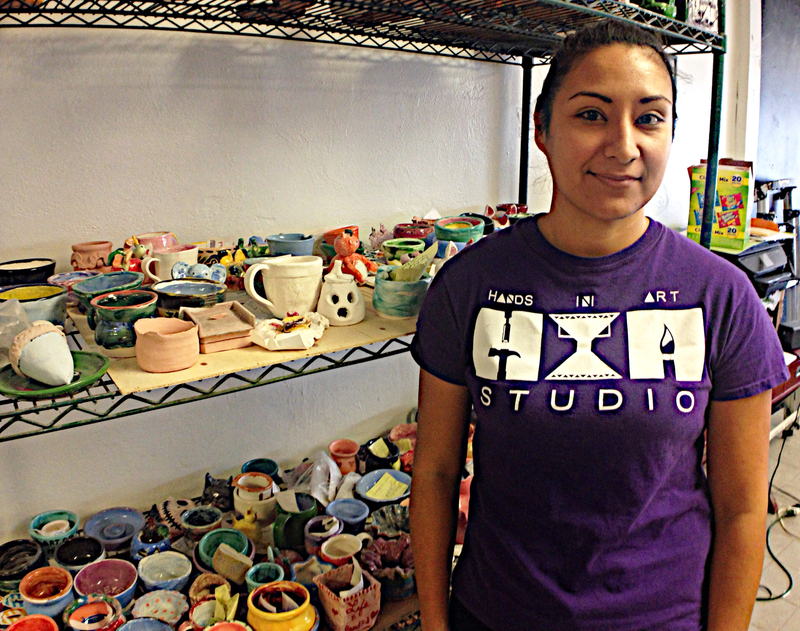 Ramirez, meanwhile, is working with a customer to help her finish up a pottery project. 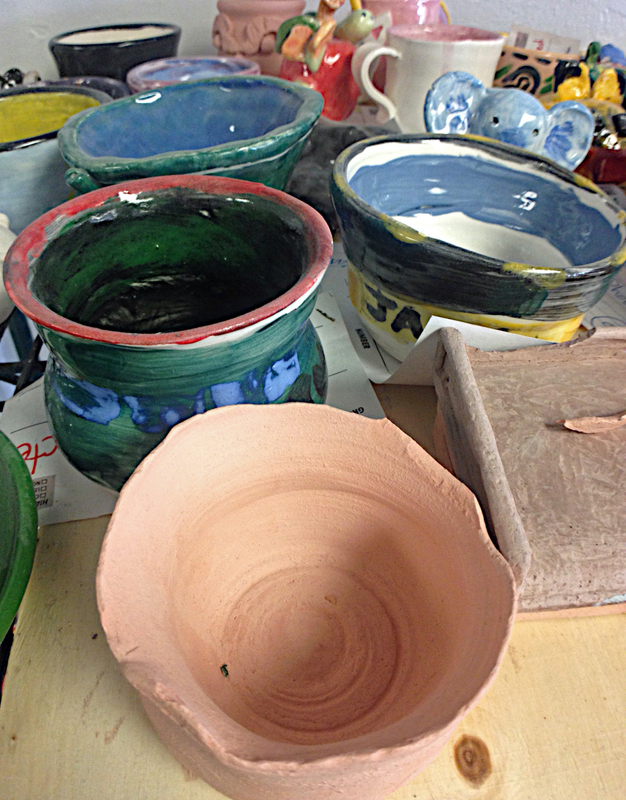 It has been a busy week at Hands In Art with daily workshops and after-school programs in ceramics and painting among the arts-and-crafts activities at the Mission business. 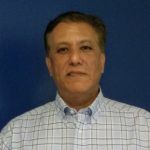 Ramirez opened her business with the help of the Mission Economic Development Corporation, which gave her insights on creating a business plan and how to approach financial institutions for loans. Ramirez impressed the EDC with her business presentation and was the recipient of a $10,000 Ruby Red Ventures grant to help start up her business. “Hands In Art is a hidden treasure of a business in Mission,” said Teclo Garcia, the director of strategic partnerships for the Mission EDC. 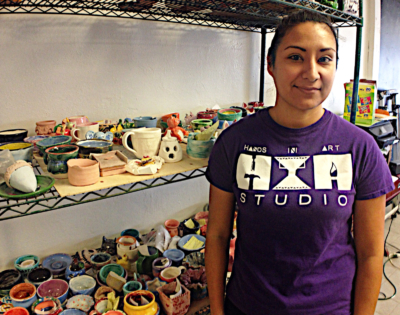 The concept of Ramirez’s business is that Hands In Art has the equipment such as pottery wheels, slab rollers, wedging tables and a kiln (an oven used for baking pottery), which in combination with her staff’s instructions gives customers the ability to create art beyond what they can do at home. Many of her customers are relatively new to art and are looking for a new creative outlet, or may already enjoy crafts but want to gain more expertise. “We’re the first to do what we do in the Valley,” said Ramirez, a Mission native, of the variety and blend of services Hands In Art offers. Ramirez said her business is evolving. Looking at the Hands In Art website and seeing the menu of choices reinforces that description. Workshops and classes in making wreaths, coffee cups and mugs, ceramic earrings and string art are among the offerings. 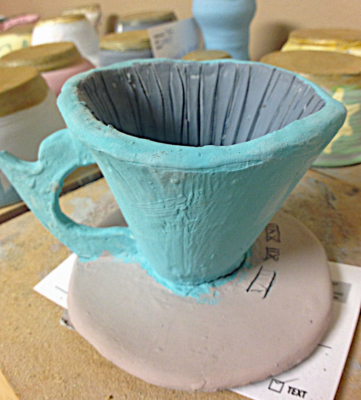 There are also studio memberships where customers have access to the studio’s equipment and clay, and learn how to hand-craft pieces that are dishwasher and microwave safe. Then there’s the party packages where children and adults can have a festive time and do wood painting, string art, canvas painting and clay work. For Teresa Trdla, it was the creative angle to host a birthday party for her daughter and friends and have the girls create art while having a good time together. Ramirez beamed with pride as she saw the girls work on their art. “That’s what I enjoy most,” she said, seeing the smiles on people’s faces, especially children.